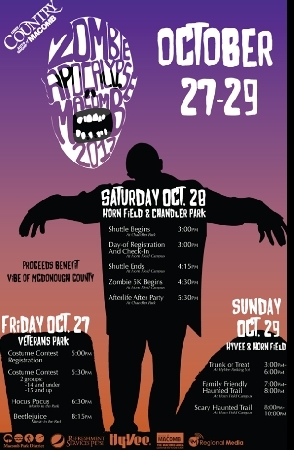 MACOMB, IL -- Western Illinois University's Horn Field Campus will partner with the Macomb Park District to present Zombie Apocalypse Macomb 2017 Friday-Sunday, Oct. 27-29. On Saturday, Oct. 28, the Zombie 5K will begin at 4:30 p.m. at Horn Field Campus, located at 985 China Road, south of Macomb. A shuttle to the location will run from 3-4:15 p.m., leaving from Macomb's Chandler Park. The event will culminate with an Afterlife After Party at 5:30 p.m. at the Outskirts, 201 S. Shady Lane, Macomb. 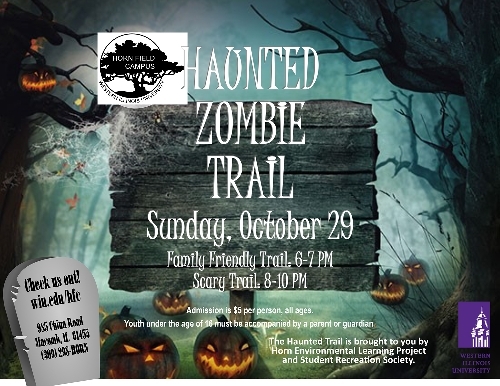 Preregistration for the Zombie 5K is $20 and can be completed at tiny.cc/ZAM5K2017. The second Horn Field event is the annual Haunted Trail Sunday, Oct. 29. The "family friendly" version will run from 6-7 p.m., followed by a "scary haunted" version from 8-10 p.m. Admission is $5 per person, and individuals of all ages are welcome. Individuals under the age of 16 must be accompanied by a parent or guardian. Additional sponsors of the event are Refreshment Services Pepsi, the Macomb Hy-Vee store, the Macomb Area Convention and Visitors Bureau, Nick Curtis, realtor – RE/MAX Unified Brokers, Kunes Country Auto Group of Macomb and Regional Media. For more information, contact the Macomb Park District at (309) 833-4562.